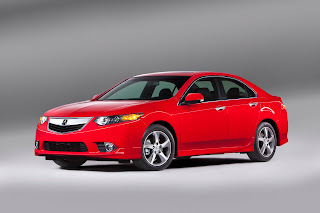 Continuing the celebration of its 25th anniversary, Acura today announced the availability of a new version of the popular TSX sports sedan for the 2012 model year. Designed to evoke the fun-to-drive 4-cylinder Acuras of the past, the TSX Special Edition will add even more sportiness to the TSX lineup thanks to numerous exterior and interior upgrades for Acura's entry-level sedan. "The Acura TSX has long been known for its high-revving 4-cylinder engines and sporty driving nature," said Jeff Conrad, vice president of Acura sales. "With the new Special Edition, the TSX becomes even more youthful and sporty in character, furthering its appeal to performance-minded buyers." The 2012 TSX Special Edition package consists of numerous upgrades to the exterior including a more aggressive front spoiler, a new rear bumper fascia, unique side sills and an exclusive "Special Edition" badge on the trunklid. Finally, the TSX's 17x7.5-inch, 5-spoke aluminum wheels will feature a polished finish with dark grey background, unique to the Special Edition model. Inside, the TSX Special Edition makes use of sport-minded appointments including exclusive seating surfaces with perforated black Lux Suede® inserts with red backing. Unique red stitching, used for the seats, steering wheel and the shift knob, combines with red lighting for the instrument cluster gauges, overhead lighting and footwell lighting. Adding more appeal to the driver's footwell are aluminum pedal covers with a race-inspired look. Rounding out the Special Edition's interior upgrades is the use of bright silver plating for the steering-wheel-mounted paddle shifters along with black headliner material (standard TSX have grey headliner material). 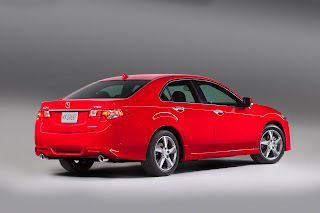 The TSX Special Edition package makes use of Acura's acclaimed K24 2.4-liter 4-cylinder engine and will be available with either the close-ratio 6-speed manual or Sequential SportShift 5-speed automatic transmissions. The TSX Special Edition will go on sale in late September and will make its public debut at the Orange County International Auto Show on September 22nd. Acura offers a full line of technologically advanced performance luxury vehicles through a network of 271 dealers within the United States. The 2012 Acura lineup features six distinctive models including the RL luxury performance sedan, the TL performance luxury sedan, the TSX sports sedan and Sport Wagon, the turbocharged RDX luxury crossover SUV, the award-winning MDX luxury sport utility vehicle and the ZDX four-door sports coupe. Along with every new Acura, the 2012 TSX is covered by a comprehensive 4-year/50,000 mile new vehicle limited warranty and a 6-year/70,000 miles powertrain limited warranty. Additional benefits include Acura Total Luxury Care® (TLC®), which provides free 24-hour roadside assistance, concierge service and trip routing. Acura is beyond confused. We got Type-S models and now an SE model? And all the SE model has is a bunch of red color and Lux Suede seats. I don't get it. It's like they planned a Type-S & then changed their mind. As a compromise, they gave us the cosmetic changes but nothing engine/tire/suspension/etc wise. I totally agree with your statement. Seems like really inconsistent planning on Acura's behalf. Tony Stark in an Acura?